Formed in 1946 by Frank Males & Bill King, the former living just two doors away from the track. Because of this he considered both the team and the track to be his own personal property, and when he lost interest, or fell out with team members, then the team did not run. After ceasing to run for at least a couple of years, Bill Gadsby was approached by Frank Males in 1957 to both manage and ride for the club, and although still riding for the Wembley All Stars, Bill organised challenge matches for the team. New Body Colours were made by Bill, and instead of having the traditional Ace of Clubs, Bill used the Ace of Hearts(HERTS). When Langley Lions(Stevenage) dropped out of the League, Bushey Aces took their place, but unfortunately the team was very weak, with only two established riders available. Riders were eventually signed from other defunct clubs in the area, but unfortunately Frank objected to this, and many riders, including Bill Gadsby, joined the Wembley Tigers. Track was on Windmill Lane Recreation Ground, Bushey Heath. Raced in the North West Middlesex League 1948 +. Club Secretary: Miss Joan Males, 85 Windmill Lane, Bushey Heath. E. Wildman served on the NACSA Esecutive Committee in 1961. Changed the name to Bushey Kangaroos in 1957, before finally becoming Bushey Saints in 1967. 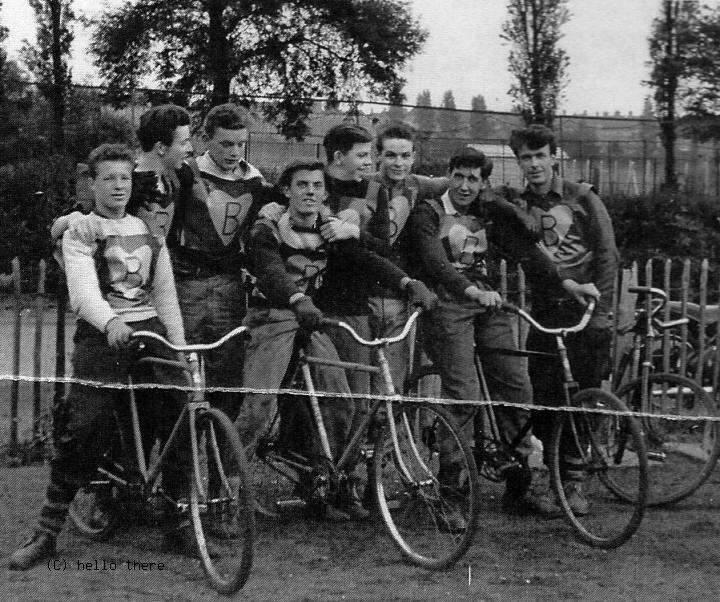 During the Summer of 1946 a group of lads returned from watching a motor-cycle speedway meeting at Wembley Stadium and assembled at the local recreation ground in Windmill Lane where they tried to imitate their heroe's skills on bycycles. After a few weeks practise, the small group took up challenges with other groups from Bushey and Watford. In the following year matches were arranged between the Bushey Heath representative side and teams from Water Lane and Radlett Road, Watford. From those early beginnings Bushey Heath Aces were formed by Frank Males and Bill King. They persuaded Mrs I.I. Males to become manager and Miss J. Males to act as team secretary.. The committee approached Bushey Urban District Council, the owners of the land where the track was situated, for permission to use the site on a permanent basis. With much support from Councillor Frank Collins and the local residents, the Council agreed. In 1948 Bushey Aces registered with the North West Middlesex Cycle Speedway League and the National Amateur Cycle Speedway Association and became an official cycle speedway club. Matches were of 16 heats for League Matches, 18 heats for Cup and Test Matches. Each heat consisted of four laps of the track with four riders taking part, two from the home team and two from the visiting team. The captains from the two teams tossed a coin to see who claimed the prime position every other race. Each team consisted of eight riders and competed in matches on a home and away basis. The Bushey Aces achieved third place in the League table that year on their first attempt, the League consisting of Northwood Broadsiders, Harefield Pirates, Hillingdon Racers, Iver Heath Eagles, Hillingdon Phoenix and Harefield Hornets. The North West Middlesex League also organised Individual Championships and four-a-side and Cup Competitions. However the National Amateur Cycle Speedway Association Individual and Team Championships were sponsored by the News Chronicle newspaper, with Mars Confectionary Ltd sponsoring the National Golden Helmet and Silver Helmet for County winners, which were competed for monthly..
One of the sport's biggest handicaps was that, when riders began to show potential, their careers were interrupted by the call of National Service for over two years. Because of the loss of some riders, Bushey Aces Management recruited Terry O'Connor from Stockwell Aces and Dennis Manucci and Harry Teasedale from Northwood. The Bushey Management team also encouraged the expansion of the Watford & District League with a view to using it as a nursery for future riders. This League consisted of Water Lane Rockets, Riverside Rookies, North Watford Wasps, North Watford Black Panthers, Oxhey Eagles, Paddock Road Pirates, Mill End Tudors(Rickmansworth). From then on Bushey went from strength to strength, with many Watford & District League riders appearing for the club in the higher levels of the sport. With a surplus of riders wishing to ride for Bushey, a second team was formed, known as Bushey Bulldogs, which entered the second division of the North West Middlesex League. Bushey was represented at County and Area Level in all Competitions. As very few teenagers owned their own motor vehicles, the Bushey Management hired Garrads, a Radlett Road Removal firm to transport riders and machines to away fixtures. The bikes were stacked at the rear of the van, with the riders sitting in a canopy above the drivers area. At the rear of the van there was a tailboard with canvas curtains, these being left open for ventilation. They also hired a double-decker bus from Elm Coaches from Kenton . During this period Bushey Aces never finished below 3rd position in the league(North West Middlesex) and monopolised the Watford & District League Championships with their riders winning many individual honours.The club also had a Match Race Individual Championship, held monthly, with the highest points scorer of the month challenging the Match Race Champion. Many of the Bushey riders represented their County and area in invitational Individuals. Bushey Aces also had the distinction of competing in the 1951 Festival of Britain Cup held at Battersea Park, plus the 1953 Coronation Cup. Bushey Aces fortunes reached a low ebb following the death of their manager, Mrs I.I. Males. Frank Males acted as temporary manager until the end of the racing season, after which he was admitted into hospital for an operation. In 1957 he negotiated with Bob Saunders, manager of Brickett Wood Kangaroos, to make use of the Windmill Lane Track. This was the end of the Bushey Aces, but Frank Males and a couple of local riders joined the Kangaroos as riders in the London & Home Counties League, as well as competing in the County and National competitions(continued under Bushey Kangaroos).